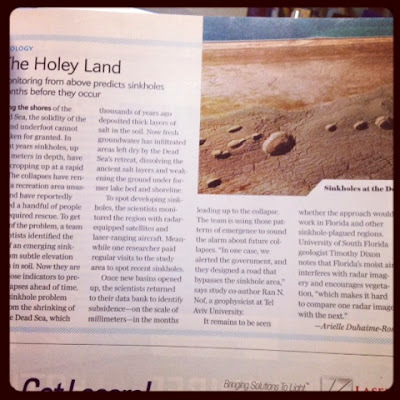 The "Holey" land! Get it? Cause it's about sink holes by the Dead Sea? It's super cheesy, but I giggled when I saw it and then the light bulb came on, "Oh! Here is something funny! Hurry, pull out your phone and take a picture before you forget!" So there you go. Something funny in a very cheesy way. I hope it made you smile (even if your rolled your eyes after)! By the by, this article is from the Scientific American that was released February of 2014. Arielle Duhaime-Ross wrote the article.